Transporting one of NASA’s external tanks from Michoud Assembly Facility (MAF) to the Kennedy Space Center in Florida is no simple operation. The external tank, which is 153.8 ft long, 27.6 feet in diameter and weighs approximately 58,500 pounds, is transported via a specially designed and built, ocean-going barge. 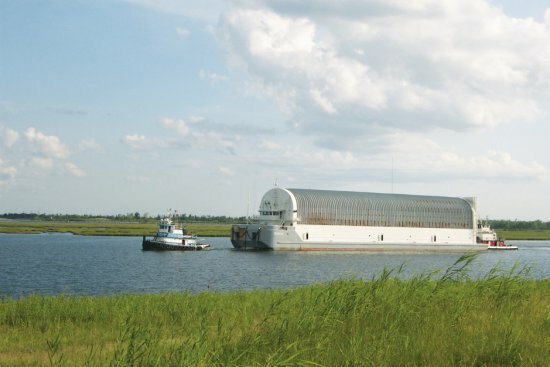 The barge, known as the Pegasus, is 266 ft long and 50 ft wide and is currently utilized by the Space Shuttle Program to transport external tanks over 900 miles of inland and open ocean waterways from the Michoud Assembly Facility to the Kennedy Space Center in Florida. For this trip external tank number 134 (ET-134) is our Very Important Passenger — a genuine VIP. Three seamen and one technician crew the barge 24/7 when underway from the barge’s regular mooring site near the Vehicle Assembly Building at Kennedy Space Center. In Greek mythology Pegasus is a winged horse, captured by and made to serve warrior Bellerophon. Among the many versions of Pegasus’ role and life there are two that seem to stand out. In one version Pegasus brings forth water or fresh springs where ever she steps. In another version Pegasus brings forth lightning or is the god of lightning. The role of NASA’s Pegasus seems to integrate both these mythological versions; NASA’s Pegasus lives, works and travels on water. And Pegasus delivers to the Kennedy Space Center the external tanks that feed the smoke and fire of a space shuttle launch; smoke, fire, thunder, and awe. For many years the Pegasus, towed by the reusable solid rocket booster (RSRB) recovery ships, took the route through the Mississippi River — Gulf Outlet (MRGO) out to the Gulf of Mexico. Recently, MRGO was closed to larger ships due to significant shoaling and severe erosion caused by Hurricane Katrina. This route was utilized up through ET-128 and took approximately 4 -5 days for the barge to arrive on dock at Kennedy. Today Pegasus is towed by two commercial tug boats along the Gulf Intracoastal Waterway (GIWW) through the Mississippi Sound to Gulfport, Miss. The Gulf Intracoastal Waterway route is approximately 25 miles longer, with one day added to the travel schedule. Solid rocket booster recovery ship Liberty Star will meet Pegasus at Gulfport, take Pegasus in tow and depart south into the Gulf of Mexico. Pegasus is manned 24 hours a day from the time it leaves Kennedy, goes to MAF and returns to Kennedy. On average, a round trip takes between 10-11 days. Once the last external tank is shipped, the barge will be utilized by Ares I Upper Stage which also plans to use the Gulf Intracoastal Waterway route. Marshall Space Flight Center engineers developed the technical requirements for the Pegasus Barge, Halter Marine created the design and produced the drawings. Gulf Coast Fabricators of Pascagoula, Miss., constructed and completed the 1,648 ton Pegasus in June 1999. NASA has used many barges to transport large spacecraft components from their respective manufacturing sites to Kennedy. Other NASA barges including Orion, Poseidon, Little Lake, Palaemon, Pearl River, Promise and USNS Point Barrow were used to tow Saturn vehicle components between Marshall , MAF, California and Stennis Research Center to Kennedy in Florida. Of the older barges, only Poseidon remains docked at Stennis, awaiting final disposition. Nice mythology reference. Maybe like Bob Jovi, this is the “steel horse” you ride. Nice information on a side of NASA I knew nothing about. Good luck and smooth sailing once you leave Michoud. They must have to be v-e-r-r-r-y careful with that tank not to ding up the foam. Amazing that the tank can get such a smooth ride by water. A credit to the planning and engineering before it sets sail. How is a barge given a “final disposition?” Does that mean it ends up in a scrap heap, or is it somehow recycled? I didn’t have much ideas about Pegasus.But relating NASA with the Greek mythology was simply awesome.Pegasus: The ‘Winged Horse’ of the Space Program goes so very apt with this blog.I am thrilled to know more about it and would definitely like to give the sheer credit to the management team behind Pegasus’ success.